Who is the king of streaming music service? Many users may use Spotify as answer. As of March 2018, Spotify has most users than any other streaming music services including Apple Music. However, Apple Music is growing quickly and will overtake Spotify in terms of US subscribers this summer. In this article, we will compare Spotify with Apple Music from all main factors including audio quality, file format, supported devices, supported countries, pricing, total amount of music library, music discovery and sharing, etc. to help you choose the one suits you better. We also introduce Apple Music Converter and Spotify Music Converter to help you enjoy them on iPod, PSP, Walkman, MP3 players and more. When talking streaming music service, what will come to your mind? Spotify, Apple Music or some others? As of March 2018, Spotify and Apple Music are the top two streaming music services in the world. You may use both of them, but to most users, one streaming music service is enough. So which one should be chosen? When choosing a streaming music service, there are some factors you may consider. Audio quality, file format and supported devices, supported countries, pricing, features of music discovery and sharing, etc. Depending on which you care most, you can choose the one that suits you better. In this article, we will compare Spotify with Apple Music in all main aspects. As of July 2018, Apple Music has got more than 50 million paid users while Spotify as got more than 83 million paid subscribers. And, it's said by Eddy Cue that 8 million users are in the period of 3-month free trial. According to Spotify's press release, Spotify now has a total of 180 million active users. That is to say, Spotify Free and Premium users take about 50% respectively. Apple Music provides 3-month free trial to new users, any free trial users can fully enjoy all the songs and features, there won't be any difference between free trial and formal subscription. Meanwhile, Spotify provides free plan to all users, and there are many limitations and disadvantages compared with Spotify Premium. Apple Music streams at 256bkps, which is same audio qaulity as the songs you purchased from iTunes Store. Apple Music audio quality is same on all platforms including PC, Mac, iOS, Apple TV and Android. As to Spotify, it depends on your account type and device you are using. On Windows or Mac with Spotify desktop app, Spotify Free is 160kbps and Spotify Premium is 320kbps. On web player, it's 128kbps for free and 256kbps for Premium. On iPhone, iPad and Android, Spotify Free could be 96kbps or 160kbps depending on your network and settings and Spotify Premium is 320kbps. When streaming Spotify with Chromecast, it's 128kbps for free users and 256kbps for premium users. Downloaded Apple Music songs are protected AAC files with *.m4p file extension while downloaded Spotify songs by premium users are protected Ogg Vorbis files with *.ogg file extension. Both downloaded Apple Music songs and Spotify songs are DRM protected and can be only listened on supported devices with your account authorized. If you want to enjoy Apple Music or Spotify on unsupported devices like iPod Nano/Shuffle, Sony Walkman and MP3 players, you can use Apple Music Converter and Spotify Music Converter respectively, we will discuss the programs in this article later or you can click the links to view the details. You need to meet the system requirements to enjoy Apple Music or Spotify on different devices. Please check the table below. From the comparison table above, we know that Spotify supports more devices than Apple Music. 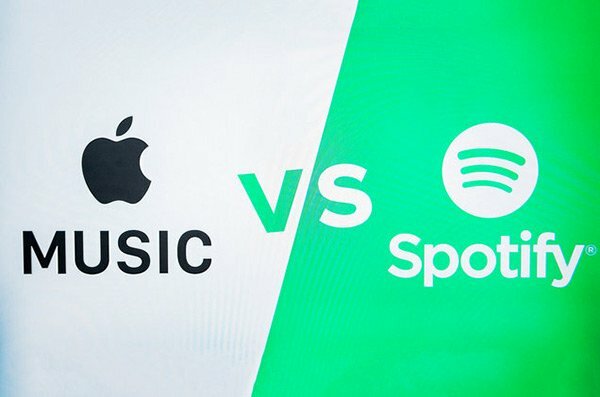 Spotify is unavailable on Apple TV while Apple Music is unavailable on Android tablets. And Spotify can be directly played on mainstream web browsers like Chrome, Firefox, Edge and Opera on Windows, Mac, mobile and tablets. When choosing Apple Music or Spotify, make sure your device can meet the minimum requirements. As of March 2018, Apple Music supports 115 countries or regions while Spotify only supports 51 countries or regions. You can check the full list of Apple Music Supported Countries or Regions in Apple's official website and check Spotify Supported Countries or Regions in Spotify's official website. Spotify first gained its dominant position with more than 30 million songs and it adds more than 20,000 new songs each day. As of March 2018, there are more than 40 million songs in total on Spotify. Apple Music has more than 45 million songs which is superior to Spotify. For Apple Music, you can use Beats 1, "For You" section, New tab and "connect" features of musicians to discover new music. For Spotify, you can discover new music by using built-in Browse, Discover Weekly, User-made playlists, Radio stations, advanced genre search, related articles and following artists & friends. To enjoy Apple Music after 3-month free trial or enjoy Spotify Premium, you need to pay for subscription fees. Both Apple Music and Spotify provide Student, Individual, Annual and Family plans, and the prices are the same. However, Spotify provides some other options. For new users, they can try Spotify Premium for free for 7 days on a mobile device. This automatically starts and ends, so requires no payment details. Spotify also offers longer trial periods which do require payment details. Though you can sign in an Apple ID on multiple devices and you can enjoy Apple Music on multiple devices, you can only play Apple Music on one device at the same time. If you want to play Apple Music songs on 2 or more devices simultaneously, you need to buy Family Plan. With Apple Music, as long as you have enough free space, you can download as many songs as you like. With Spotify, you can only download 10,000 songs on one device, though you can download on 5 devices. Apple Music Converter and Spotify Music Converter are DRM removal programs to help you enjoy your favorite songs on all kinds of devices without any limitation. Apple Music Converter can convert any downloaded and online Apple Music songs in iTunes library to MP3, M4A, AIFF, AU, AC3, FLAC and MKA with ID3 tags and 100% original audio quality. 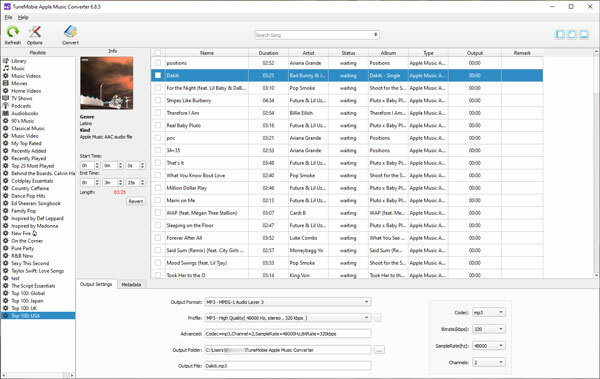 Apple Music Converter performs at 16X faster conversion speed and allows you to rename and sort converted songs by ID3 tags and characters in bulk. Besides, Apple Music Converter can also convert iTunes M4B audiobooks, Audible AA/AAX audiobooks and other iTunes compatible audio formats. Apple Music Converter is available for Windows and Mac, fully supports latest Windows 10 and macOS Mojave 10.14. Below is the main interface of Apple Music Converter. 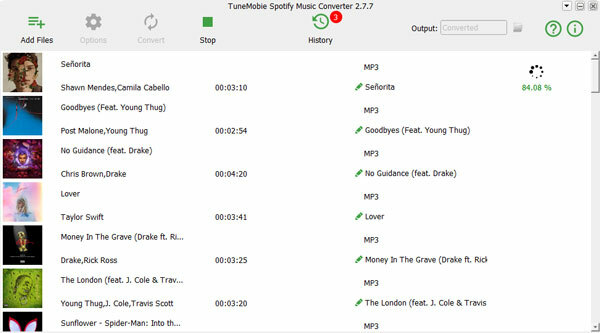 Spotify Music Converter can download Spotify songs, albums and playlists to PC and convert to MP3, M4A, WAV and FLAC with ID3 tags kept. Spotify Music Converter supports both Spotify Free and Spotify Premium accounts. You can either drag and drop songs, albums or playlists from Spotify to Spotify Music Converter or copy URL from Spotify and paste in Spotify Music Converter. Spotify Music Converter performs at 5X faster conversion speed. Spotify Music Converter is also available for Windows and Mac and fully supports latest Windows 10 and macOS Mojave 10.14. Below is the main interface of Spotify Music Converter. Which one is better for you, Apple Music or Spotify? Maybe you have got the conclusion. However, no matter which streaming music service you choose, you can break the limitations and enjoy them on any devices you like.